Hawkeye Sidekick after a meh round four (47 points) performance is under the cosh. The Hail Mary / Toca Me selection of Calvert Lewin last week got what it deserved; absolutely nothing. 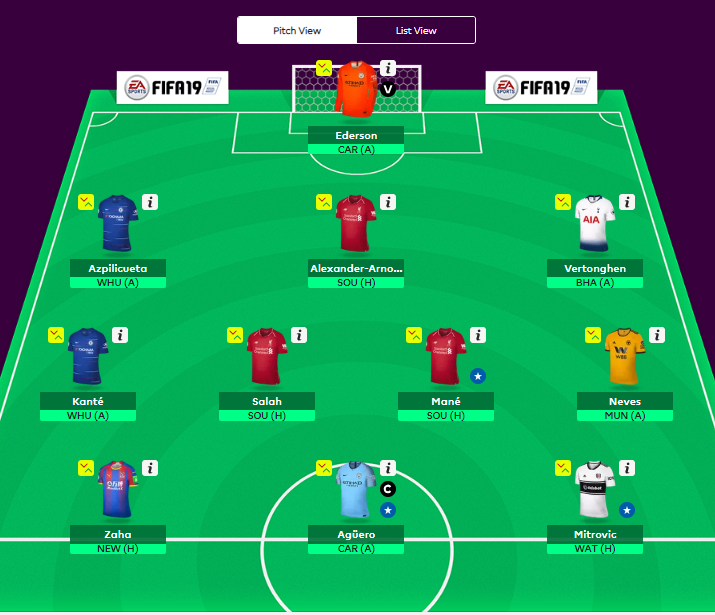 It is time to move the deck chairs and tables around this FPL selection in attack hoping for some more points from all three attackers. Ederson continues in goal; seven points last week was a superb return, do not see any other keeper in my side (infamous last words). The back three continues as last week. Alexander-Arnold continues to worry me, think his club colleague Robertson is the option going forward but will give it another week. Azpilicueta is a solid pick; will pick up clean sheets throughout the season. The fixture list last week conspired a bit but expecting better from the midfield selected. Southampton are primed for a thumping and Mane and Salah should get sufficient chances to score and provide assists. Mane gets into so many great positions; if he only converted half those opportunities, jackpot time. Neves has being quiet in recent weeks but Wolves are so easy on the eye that they could upset Manchester United so retain him in the side. Sergio continues to produce superb numbers; fourteen points last week was just desserts and a trip to Cardiff City who look incapable of keeping a clean sheet bodes well. Zaha got off the turf and slayed Huddersfield Town last week on the road; seven points tally and with Newcastle at home, hopes are high for another good day out for Mr. Crystal Palace. The Hawkeye Sidekick change or others will perceive as the ‘throw it on the team and sees if it sticks selection’ is my new best friend Mitrovic; he has had a promising start to the season with a couple of goals for club and country and I think a Watford team who lost last week may be a good pick. Watford after a strong start have a serious test of attitude this week and Fulham may be the benefactors. Mitrovic hopefully picks up the goals for the Craven Cottage outfit or he will be out on his ear (Barry Fry management 101). Fingers crossed for this week! This entry was posted in soccer and tagged fpl, soccer. Bookmark the permalink.